Lemon Balm is an open-pollinated, fragrant, lemon-scented herb that can be used to add flavour to meals or made into a relaxing warm tea. Simply pour boiling water over the leaves to infuse the water with mild lemon flavour. Perennial. 10 to 11 weeks to harvest. Each packet contains about 200 seeds. 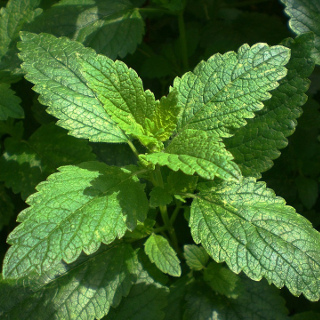 Lemon balm is native to parts of central Europe, the Mediterranean, the Middle-East and central Asia. Records of lemon balm's cultivation date back to at least the 7th century with the use of wild plants dating back even further to the ancient Greeks and Romans. Lemon balm leaves make an excellent herbal tea, simply place a few fresh sprigs at the bottom of a mug and pour boiling water over them to extract their refreshing flavour. Lemon balm tea is said to promote relaxation and aid digestion. Dried lemon balm leaves can be crushed and added to pickling liquids, seasoning mixes and marinades. Lemon balm oil extracted from the leaves can be used to make natural perfumes and in aromatherapy. During the warmer months of the year lemon balm will produce small white flowers that are rich in nectar and these will help attract bees and other insect pollinator species to your garden. Lemon balm leaves are fragrant and make a wonderful addition to potpourri mixes. In cooler climates lemon balm should be grown in full sun for speedy growth. Gardeners in warmer climates should instead grow lemon balm in light shade as plants in full sun may wilt and become heat-stressed during the hotter parts of the day. Lemon balm grows best in a fertile, free-draining soil rich in organic matter, if your garden is lacking place down a layer of compost or well-rotted manure prior to planting. Fertilise with a complete organic fertiliser if growth is slow or at the first sign of unhealthy leaf yellowing or any other nutrient deficiency. Lemon balm shouldn't require supplementary fertiliser if the soil they are growing in is healthy. Lemon balm requires regular watering, in warm climates it will often wilt and start to die back if it goes too long without water. Mulch around lemon balm clumps to help retain soil moisture and keep their root systems cool. In areas that suffer from frosts lemon balm will die back during Winter but will re-shoot from the roots in Spring as the weather warms. Lemon balm clumps can be propagated by division, it will set down roots along any stems that are in contact with damp soil. Lemon balm can spread aggressively like mint when growing conditions are ideal, so keep a watchful eye on it and regularly dig out segments that are invading on other plants. To contain its spread lemon balm can be grown in pots but container-grown plants will dry out quickly so saucers should be used. In cold and mountainous regions of Australia sow lemon balm seeds from mid to late Spring. In temperate regions of Australia sow lemon balm seeds from mid Spring to early Summer. In subtropical regions of Australia sow lemon balm seeds any time during Spring. In tropical regions of Australia sow lemon balm seeds during the dry season from late Autumn to mid Winter. Lemon balm seeds are tiny so surface sow them and cover with only a very fine sprinkling of growing media. If starting seeds in trays prick out individual seedlings as soon as they are large enough to handle and transfer to individual cells or pots. Thin direct-sown lemon balm seedlings or space starts about 25cm apart, this will provide sufficient room for their root systems to grow while still being close enough together for the plants to form a solid carpet of foliage once established. Lemon balm seeds can be slow to germinate, but most seedlings should emerge 10 to 20 days after sowing. Lemon balm takes 10 to 11 weeks to grow large enough to begin harvesting shoot tips. Harvest shoot tips regularly to encourage stems to branch out further. Lemon balm is a perennial herb that will produce over many years if well looked after.